- now they have none. On June 20, 1997 the U.S. tobacco industry, state attorneys general, representatives of the public health community, and plaintiffs' attorneys crafted a proposal that would transform the way tobacco products are regulated, manufactured, marketed, and sold in the United States. Tobacco companies agreed to pay $368.5 billion and accept extensive federal regulation over their products and their advertising in exchange for protection from future lawsuits. Soon after the agreed settlement reached money hungry Washington, politicains began scuttling the agreement and drafted a classically liberal bill by Senate Commerce Committee Chairman John McCain (R-AZ) that raised the agreed to price-tag from $368.5 billion to $516 billion to fund new bureaucracies and reneged on the agreement to grant the industry immunity from lawsuits. It was only after this betrayal and breech of agreement that the tobacco industry broke off talks on legislation. They had an agreement with the tobacco industry a year ago! It was an agreement that presumably fulfilled their stated desire to "protect the children." But now, because of their greed, Democrats have blown it. They had an agreement a year ago - now they have none. Championed by recent settlements between states and the tobacco industry, Congress attempted to pushing through one of the largest tax increases in American history called the National Tobacco Policy and Youth Smoking Reduction Act. Increase cigarette taxes by $1.10 over five years. Senator Kennedy has proposed even a higher increase of raising taxes by $1.50 a pack. Those people earning less than $30,000 a year would pay 53% percent of this tax increase and a whopping 97% of the taxes would have come from people making under $75,000. Section 404 of the bill specifically forbade the tobacco companies from paying the tax on smokers behalf. This is not a tax on the tobacco companies ... it's a tax on the American people! Cap the amount of damages the industry would pay plaintiffs at $6.5 billion a year. Limit the cigarette industry's ability to advertise, with restrictions on billboard advertising. Give the Food and Drug Administration the power to regulate nicotine. Impose up to $3.5 billion a year in fines if youth smoking does not fall by agreed-on goals. An $18 billion buyout program for tobacco farmers. The media has largely mischaracterized this bill as a measure that would punish tobacco companies by having them pay an estimated $516 billion over the next 25 years. The truth is ... the tobacco companies don't pay that $516 billion ... consumers pay and the American taxpayer pays! The McCain bill required the tobacco companies to make annual payments to the government, and to pass through the costs to consumers. McCain's bill is not unique in this respect: All proposed tobacco legislation would, through "pass-throughs" or direct taxes, raise prices for consumers. McCain's bill represents the largest tax increase in American history being disguised as a punitive action against an evil industry causing millions of deaths of Americans. It is, in fact, a massive tax increase to fund expansion of the federal bureaucracy. WAKE UP folks, they are after your wallet! It is going to cost hundreds of billions of dollars, spent on a myriad of programs, a lot of which don't have to do with tobacco. "Everybody that has touched it has made it worse," said Senate Majority Leader, Trent Lott, R-Miss. "It's become such a massive tax bill now -- such a massive government program with incredible spending. Deny tobacco companies the legal shields they demand. Approve new authority to the Food and Drug Administration to regulate the manufacture of tobacco products. Launch a national advertising campaign, overseen by the White House's office of national drug control policy to discourage teens from smoking and taking drugs. Create federal guidelines for states to enact laws penalizing sellers of tobacco to minors. Encourage states to penalize minors who possess tobacco by notifying their parents, suspending their drivers' licenses and requiring them to perform community service. Allow states that cap lawyers' fees to keep proceeds of their lawsuits against tobacco companies. Who would have benefited most from the National Tobacco Policy and Youth Smoking Reduction Act? The Federal government expects to collect $860 billion from this tax increase. A large part of the money taken from low income familes will be spent to pay against the National Debt and fund 17 new bueracracies. The Food and Drug Administration alone was to get an additional $100 million in its budget for their Youth Tobacco Prevention Program. The Senate approved a GOP-backed amendment to spend billions of additional dollars on the war on drugs. This National Lawyer Enrichment deal will not make attorneys instant millionaires. . . . Some of them will become BILLIONAIRES! Rather than spending huge amounts of money on children's health or health in general, a small group of trial lawyers will be enriched with limitless fees charged through tobacco related litigation. Provisions of the proposed tax legislation before Congress allows families to be taxed in order to pay plaintiffs attorney's as much as $4,000 an hour to pursue tobacco related lawsuits. Sen. Orrin Hatch (R-Utah) defended trial lawyers ability to collect huge fees, calling them the "last bastion of freedom." Republicans have sought to ease this massive enrichment of attorneys by limiting them to only $1,000 an hour! Yep, that's right, $1,000 an hour! While that may be a whole lot less than $4,000/hr., it's still a whole lot more than most people earn in a week. Prosecution for profit. The vulture mentality of trial lawyers now use the court system as a legal playground for the purpose of extortion of funds from targeted defendants. Today it is tobacco, tomorrow will be a different target, take your choice. They will use the billions of dollars they get from a tobacco bill to file suits against other industries creating a nightmare in our legal system. The states attorney's generals are looking to the deep pockets of tobacco companies and those who choose to smoke to pay for their failing medicare systems. A large part of the money raised through this tax increase would be returned to the states to help pay their medicare costs. The Centers for Disease Control and Prevention's (CDC) released a report in 1994 claiming that smoking-related disease in the United States has an enormous economic impact. In 1993, it was estimated that the direct medical costs associated with smoking totaled $50 billion. For each of the 24 billion packs of cigarettes sold in the United States in 1993, about $2.00 was spent on avoidable medical care costs due to smoking. The study also found that smoking is responsible for approximately 7 percent of total U.S. health care costs; Federal and state funds pay more than 43 percent ($0.89 of the $2.06 per pack expenditure) of all smoking-attributable medical care expenditures; and in 1993, hospital expenditures accounted for 54 percent ($27 billion) of all smoking-related medical costs. Other costs were for physician expenses (31%), nursing home expenses (10%), prescription drug charges (4%), and home health costs (2%). A substantial amount of money ($23 Billion) was earmarked to pay for Hillary's government sponsored child care - one piece of her failed health care industry takeover. According to a press release from the Children's Defense Fund, "Any tobacco legislation this year, with or without a settlement, ought to make sure that tobacco money is used to ensure the healthy development of future generations. Quality child care and after-school activities are cornerstones of our children's healthy development." P art of the money is slated for new anti-smoking advertising. The American taxpayer is expected to pay for the government's propaganda campaign. A significant amount of money ($350 million a year) raised by this tax increase would be sent to foreign governments to help them study smoking in their own countries. Nearly 1,500 anti-smoking activists attended the 10th World Conference on "Tobacco or Health" in Beijing where one of the big issues was how to get some of the dollars from the massive U.S. settlement distributed worldwide - especially in China, the world's single largest producer of cigarettes. The conference was organised by the Chinese Association on Smoking and Health and the Chinese Medical Association under the auspices of several international bodies, including the World Health Organisation (WHO), the United Nations Conference on Trade and Development (UNCTAD), the United Nations Children's Fund (UNICEF), the International Union Against Cancer and the American Cancer Society. The co-organisers and sponsors are Bionax, the Australian and Hong Kong-based healthcare company. What About Families and Children? Families don't benefit nor do the children in those families. Those same families and children this bill is supposed to help will actually lose. The lions share of the tax burden will be borne by those families with incomes less than $30,000. Money these familes could save for their children's education or health care will be collected by the government in higher taxes. In an effort to placate some opposed to the tobacco bill because of its high cost to familes, Congress passed an amendment crafted by Sen. Phil Gramm, to cut taxes and eliminate the Marriage Tax Penalty in exchange for higher taxes on smokers. What likely was an attempt by Sen. Gramm to kill the Tobacco Bill with this amendment, turned out to backfire. Democrats and Republicans both can now focus on the return of an unfair tax in exchange for a greater tax and say they have done something for families. What a betrayal to the American taxpayer! Read more about this Clintoneze stealth tactic to make you feel good about having your taxes raised. Even in defeat, liberals continue to press their mantra, "Big Tobacco, or your Children." Just prior to the vote killing the bill, its author, Sen. John McCain (R-Ariz.) said, "If this bill fails, have no doubt, the tobacco companies win and the children of America lose." Sen. Tom Harkin, D-Iowa, said, "Joe Camel wins and our children will lose." It is a win for the tobacco industry. They have survived being taken over by the federal government. It is a win for the children of America. Their parents will not be taxed the thousands of dollars a year this bill would have imposed. They can now spend that money for things their children really need like health care, food, clothing, etc. It's a defeat for Bill Clinton. 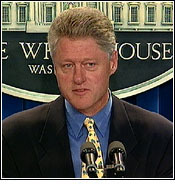 The Clinton White House failed to take over the Health Care industry, and for now have been held back from pushing through some of the provisions of their failed health care takeover. The bill would have funded several Clinton intiatives: $13 billion for anti-smoking programs, $13 billion for cancer research, and $23 billion for child care. Moreover, it's a defeat for the Clinton Whitehouse in taking over yet another American industry: the tobacco growers. Following his defeat, Bill Clinton said, "I want the tobacco lobby and its allies on Capitol Hill to know that, from my point of view, this battle is far from over." "If more members of the Senate would vote like parents rather than politicians, we could solve this problem and go onto other business of the country." Yes, Mr. Clinton, if more members of the Senate would vote like parents, you would be sitting in a jail cell or at least unemployed! It's a victory for the American taxpayer. This bill was an attempt to impose the largest tax increase in American history on American citizens, and for the time being, those taxes will not be imposed. Senate Majority Leader Trent Lott correctly pointed out the problem, "We've lost sight of the original noble cause of just dealing with teenage smoking and drug abuse." Is that any surprise? Beware... Democrats have promised to not let this thing die. They will be back attaching amendments to every piece of major legislation they consider in the hopes of pushing their agenda through piece by piece. Maybe now, lawmakers can get back to the real issue of reducing teen smoking. But, like I've said over and over again in these pages, "it's not about teen smoking," it's about your money and their control over you. Don't hold your breath for any good legislation dealing with teen smoking, but watch for the hands of government reaching into your wallet. Bill Clinton is right in one thing: "... this battle is far from over." With this bills defeat, the issue will become an explosive political issue for the fall campaign.